Owing its success to Made in Italy creativity and quality craftsmanship, NeroGiardini holds a solid leading position in the mid-range segment of the Italian market, where its products are distributed nationwide. The company has been on the forefront of distribution logistics, with a high number of NeroGiardini showrooms located all over Italy, to support a superior sales network and engage with its customers. Brand distribution is based on a combination of single brand, multi brand and franchising retail stores. The contemporary, essential design of the NeroGiardini stores, outlined in elegant black and white contrasts, reflect the NeroGiardini mood. A CONTEMPORARY, MINIMALIST, BRIGHT INTERIOR DESIGN WHERE CUSTOMERS CAN EXPERIENCE THEIR MADE-IN-ITALY SHOPPING. Since 2003, the company has opened 24 NeroGiardini single brand retail stores, including in Milan’s fashion district (Corso Venezia), in Florence’s iconic Ponte Vecchio area and Via del Corso, and in Rome’s high fashion areas (Via Frattina, Via del Corso 18). Other retails stores are located in the following shopping centres (C.C. ): “Porta di Roma”, Marghera C.C. “Nave de Vero”, Marcianise (CE) C.C. “Campania”, Marcon (Ve) – C. C. “Valecenter” via Mattei, Turin Via Pietro Micca, Trieste – C. C. “Torri d’Europa”, Trieste – via B. D’Alviano, Treviso – via S. Agostino, Pescara – via Trento, S. Benedetto del Tronto – via Montebello, Senigallia (AN) C.C. “Il Maestrale”, Chieti C.C “Megalò”, Martignaccio (UD) – C. C. “Città Fiera” via A. Bardelli, Modena – C. C. “Grandemilia via Emilia Ovest, Orio al Serio (BG) – C.C. “Oriocenter” U.169, Antegnate (BG) – C.C. “Antegnate” U.149, Casalecchio Di Reno (BO) – C.C. “Gran Reno” U.31, Turion Le Gru Grugliasco (TO) – C.C. “Le Gru”, Rimini – via Garibaldi 14, Frankfurt (Switzerland) – C.C. Skyline Plaza Frankfurt Europa Allee, 6. In March, 2010, NeroGiardini opened its first NeroGiardini Junior flagship store. NEROGIARDINI SHOWROOMSARE IN MILAN, ROME, BARI, BOLOGNA, FLORENCE, TURIN, GENOA, PADUA, PALERMO, TREVISO, CATANIA, PRATO, SAN BENEDETTO DEL TRONTO, ORISTANO, VIBO VALENTIA AND POTENZA. 2007 saw the launch of the franchising project with the opening of over 30 NeroGiardini shops: in Rome, Ragusa, Messina, Catania, Modica, Rieti, Spadafora, Ferrara, Reggio Calabria, Lamezia Terme, Vibo Valentia, Caltanissetta, Trapani, Palermo, Caltagirone, Catanzaro, Sassari, Marsala, Civitavecchia, Agrigento, Lentini, Prague, Zurich and Nanjing (China). The company plans to reach 500 NeroGiardini single brand franchisees by 2015. In Italy, 2500 multi brand retail stores distribute the majority of NeroGiardini products. 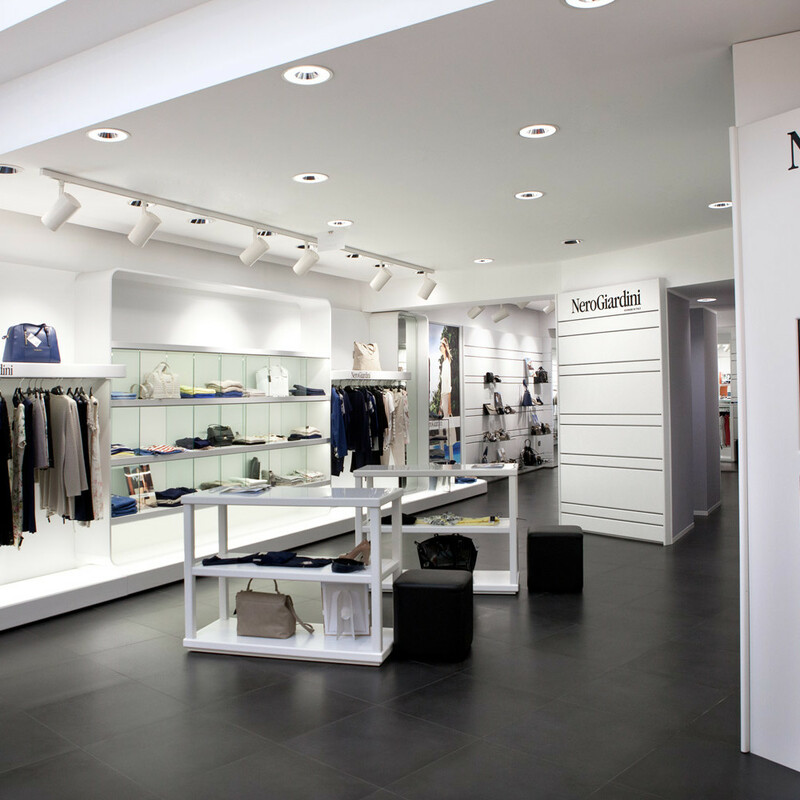 Over 500 of these stores include a dedicated display area for NeroGiardini shoes and accessories. Brand expansion plans include 100 new multi brand retail store openings in the next future. A further distribution channel is the Shop in Shop, i.e. actual NeroGiardini stores (furnished by the company) located in larger multi brand retail areas (over 120 sqm.). The purchase of the building in Corso Venezia 9–in central Milan, where the company owns two single brand stores (adults and children collections) and two showrooms–represents a milestone in the company’s distribution strategy. The €40 m investment for a 2.400 sqm building, offers opportunities to enlarge the flagship store and show all adult and junior footwear and clothing collections. The building also houses the company’s offices and showrooms to promote NeroGiardini on an international level. The international market is responsible for 20% of total sales, and the company has operations in Belgium, Spain, France, Germany, Holland, Switzerland, Portugal, Austria and Russia. By 2015, NeroGiardini aims at increasing its export sales (particularly to the EU market) to 40-45% of its entire turnover.